Israeli PM Netanyahu made a bizarre offer to the Iranian people – if it can even be called an offer. His “offer”, came in the form of a youtube video, which was also re-uploaded with Arabic and Farsi (Persian/Iranian) subtitles. In the video, he says Iran is suffering from major lack of water, and Israel wants to help by providing the Iranian people irrigation technology with seemingly no catch. In the video, he says that “The Iranian regime shouts “death to Israel”. In response, Israel shouts, “Life to the Iranian people”. The video seems to be a PR scheme, in which he is trying to frame himself as the Savior of the Iranian people, saying that Israel stands with them, and cares about them more than their own government. If you watch the video, and understand the situation, you realize however that his “offer” is a thinly veiled PR scheme at best. In the video, he talks about how Iran is challenged with major drought, and water issues, which he claims threatens the lives of regular Iranians. He says that Israel has developed state of the art irrigation technology, to circumvent their own water issues, which he wants to share with Iranian people. He seems to blame the water issues, or rather, an implied lack of Iranian solutions on the Iranian government. It must be said, that even parts of the US can suffer from irrigation issues This is not an unheard of problem in hot or difficult climates, for even powerful countries to struggle with. 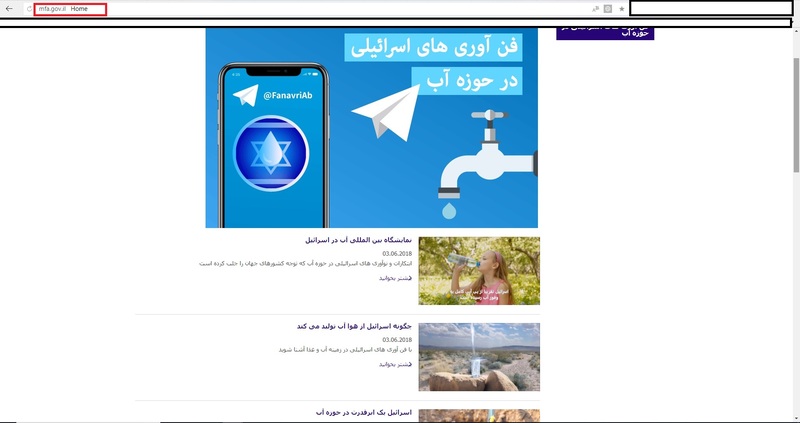 A major part of his so-called “offer“, to appear like a hero for Iranian people, is he claims to create a Farsi website to share this irrigation technology with the Iranian people. The devil is as always, in the details, however, and we will examine these details with biblical levels of scrutiny. The offer is obviously very suspicious, but not simply because it’s an obvious deception. The reason why I have written “offer”, in quotations, is aside from him calling it an “unprecedented offer”, nothing about it seems like an actual offer for several reasons. First of all, he spends the majority of the video talking about how terrible the Iranian government is, and how they allegedly don’t help their own people with their water issues. Then he claims he is going to step in and save the Iranian people by offering them this technology, but his offer seems entirely for the purpose of publicity. There seems to be nothing real at all behind these words. This is because, despite making an offer, if you dig deeper, he is actually not giving anything concrete as of now. There does not seem to be any way for the Iranian people to take this offer. As noted, he claims he will create a Farsi website with the irrigation info, yet this doesn’t seem to actually happen. We will lanch a Farsi website with detailed plans on how Iranians can recycle their waste-water. Those words clearly imply he will create a comprehensive Farsi language site, with the irrigation technology provided there. The way he describes it in the video, this is his offer, it’s not about the conflict or politics, it’s about saving Iranians by giving them the technology. Once again, the devil is in the details. If you look at the actual sites given in the video, and linked in the description, they don’t appear to match what he is describing. 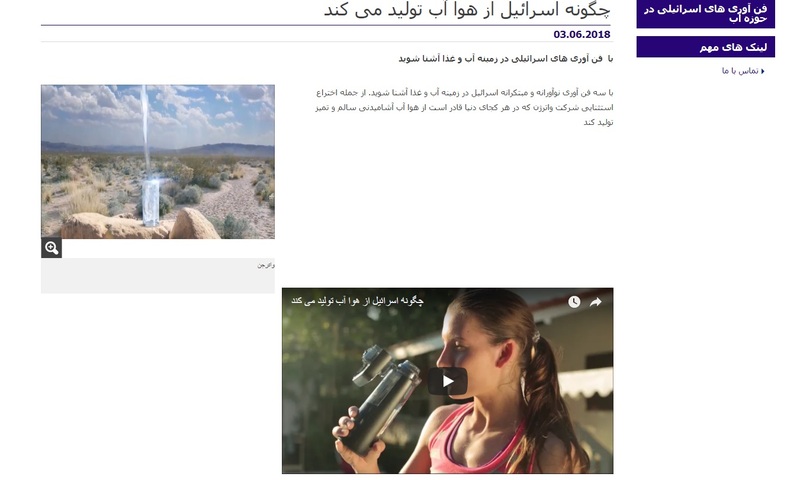 The first site that he links to, is a Farsi language, two-page archive of a total of 15 irrigation and water-related articles, on the main site of the Israel Foreign Ministry. It doesn’t even seem to come close to what he is describing. First of all, he said he would launch a Farsi language site. The word launch in modern internet terminology clearly implies creating a website. If we were going to put together a series of articles in Russian about Russian infrastructure on The Duran, we would not likely say we are going to “launch a Russian language site designed for infrastructure engineers”. This implies we are creating a totally different site under our umbrella. He implies this isn’t about politics, he is creating a website to bring Iranians life-saving irrigation technology, yet he simply links to the Israeli Foreign Ministry, which instead contains, if not direct propaganda, essentially what amounts to PR advertisements for Israeli technology. The site also conveniently contains links to other official government propag and… um… I mean… information, unrelated to water at all. So you can start reading about water, and find yourself reading official Israeli foreign relations info with a few clicks. It’s essentially product placement, but with information. At this point, one could claim this is all too picky and unfair, a matter of semantics. One can argue so long as he is delivering what he promised, what does it matter on which site. The issue is the site itself IS essentially propaganda, and moreover, it’s a Potemkin village, there is nothing really there OTHER than propaganda. Even if you don’t speak Farsi, you can click on some of the articles, use a simple online translator, and see they don’t match what he is offering. They are not comprehensive scientific pieces on how Iranians can fix their water issues They are blatant advertisements for Israeli innovations and technology. How does a video that talks about how wonderful Israeli irrigation can actually help farmers in a drought? That is like showing an advertisement for the Cleveland Clinic to a sick person in Iran, and expecting them to magically be healed by simply watching it. There is nothing wrong with ads. Their purpose is to sell a product, but the issue is he is claiming to give in-depth irrigation know how, and instead, delivers propaganda. Look for yourself at some of the articles, they’re very short, sometimes no more than a few sentences, with short 2-3min video advertisements talking about how great Israel and Israeli technology is. One can hardly see how this would help anyone. Indeed, they are relating to water, but they don’t provide anything substantial, beyond a substantial amount of propaganda. Some of the short PR and testimonial style videos are even in English, with Farsi subtitles, so you can clearly tell this was not originally designed for Iranian people. There is nothing of value in the videos, certainly nothing comparable to his great unprecedented offer. This would be the equivalent of a major food company saying they wanted to tackle hunger in Africa, and saying they will help starving, impoverished Africans, by providing their technologies and products to them, saying they will link below to resources, but the links provided are just advertisements for their company. The ads talk about how they are using automation to speed up packaging, how they use the best products, and the videos will show happy people in major first world cities enjoying their meals and their luxurious lifestyles. That is an advertisement, and it does literally nothing to help the people, and that is exactly what this website is. It would be like someone trying to end world hunger by filming themselves making gourmet meals, and putting the videos on youtube for free. He also links to an official Israeli telegram channel, where it can only be imagined you can get these type of Israeli ads sent directly to your devices, which is surely what Iranian farmers need the most. A Propaganda Campaign intended for whom? It’s obvious the Israeli PM’s offer, in its current form, as everything appears from the youtube videos, is not genuine. It is very easy to say its just a propaganda campaign, but who is it intended for? Is it really even directed against only Iranians in the first place? The languages the video were made in are most telling. The English language video is uploaded first, and the Farsi version comes afterward, separated by one of his cabinet meetings on his youtube channel. One wonders why he made an English language video? Indeed, English is the Lingua Franca, but what is the purpose if he is speaking to Iranians? Why not just make a Hebrew language video, with Farsi subtitles? Some may say because he prefers to speak English and can not speak Farsi… fine… but then why title the video in English? He does not have to speak Farsi, to have his translators title the video in Farsi. But his English video does not even have Farsi subtitles at all, it’s a separate video. He makes separate English, Farsi, and Arabic videos and the English video has the most views, currently at 113,916, while the Farsi version (below) currently has only 7,474 views. He would only make an English video, let alone title it in English, for SEO (search engine optimization) purposes. Clearly, he wants an international audience to view his video. While he pretends he is speaking to the Iranian people, Iranians mostly do not speak English, instead, he wants the world to see his “good deed”. Most telling, as noted, he created a video subtitled in Arabic. If this is only intended for Iranians, that makes no sense, as they don’t speak Arabic as their primary language. In this case, it is clear he is not just targeting an intentional audience, he is targeting an Arab, including Palestinian audience. All of that is not needed, if he just really loves the Iranian people so much, that he wants to help them. True acts of altruism are best without the need for attention…unless of course…it is thinly disguised propaganda. In this case, you would want as many people as possible to view it. In theory, he could even try to convince Iranians he truly cares about them more than their government. While it is highly unlikely anyone, including Bibi believes this will achieve regime change, it’s possible and likely that was his most ideal fantasy. At the very least, this is probably a tiny component of that ultimate goal. We’ll give you water, in exchange for your land, lives, and freedoms. P.S. If you could send us your souls too… that would be great. Apparently, he thinks it’s that easy. The Persian people will have to decide for themselves, if that’s a good offer. My guess, their answer is going to be NO. Did you forget the Palestinians and the Syrians? Israel stole their water a long time ago and they are flaunting it, plashing in their pools, while Palestinians don’t’ have enough clean water to get their faces wet. Also, the illegally Occupied Golan has much of Syria’s water and the Turks have cut off the Euphrates for irrigation. Meanwhile the Israelis poisoned much of the ground water in Stolenland during the Nakba and even more so in their quest of drug and bioweapon manufacture. No doubt the Iranians are well aware of all of this. I doubt the Iranians will take any notice of this ‘Stunt’ by the Israeli Prime Minister. It seems to be more of a PR exercise, aimed at the Israeli and Western audiences, to show Bibi’s “softer/gentle'” side. Given that Israel repeatedly, and wrongfully accused Iran of wanting to “Wipe Israel off the face of the Earth”(when in fact Iran wanted to get rid of the Israeli “Regime”, ie government) Netanyahu’s “offer” should be treated with the contempt that it deserves. If a Rattlesnake wanted to kiss you, would you accept? Timeo Danaos, et dona ferentes. The genocidal entity currently styling itself “Israel” does not give water, it takes it. An essential feature of the Zio enterprise is to sluice off every drop of water in the entire region for the benefit of Jews only. The hope is that all the goyish undesirables will die of thirst.